Weight of Cars 15,500 lbs. Built at Muni's Elkton Shops as the "Centennial Car" celebrating 100 years of San Francisco cable cars; completed on May 2, 1973, with the roof and seats from first No. 506. The car was presented to the public in a ceremony on July 19, 1973, with colors very much like the current standard paint scheme for the Powell cars. 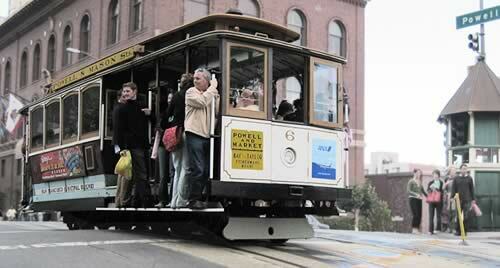 The car has a plaque honoring Friedel Klussmann, who in 1947 saved the Powell Street cable cars. Muni rebuilt it at the Washington-Mason barn, with the work completed November 1997. Built by the Carter Bros. of Newark, California during 1893-1894 for the Market Street Railway's Sacramento-Clay cable car line. The United Railroads transferred it to the Powell Street cable car lines in 1907, after the Earthquake and Fire of 1906. Until 1973, numbered as No. 502. Extensive rebuilding, by Muni 1971, using original roof and seats. Built by the Carter Bros. of Newark, California during 1893-1894 for the Market Street Railway's Sacramento-Clay cable car line. The United Railroads transferred it to the Powell Street cable car lines in 1907, after the Earthquake and Fire of 1906. Until 1973, numbered as No. 503. No. 3 is painted in Muni's green and cream paint scheme, which is based on the green and white scheme of the Muni's former rival between 1921-1944, the Market Street Railway. This was the basic paint scheme for Powell Street cable cars from 1947 to 1982. Extensive rebuilding, by Muni 1955. Built by Muni in its cable car building shops. The car body at the Muni's Woods Division carpentry shop and at Pier 80 for the running gear. Presented to the public at a ceremony at Powell & Market on Sept. 15, 1994. The first No. 4 (former No. 504, until 1973) was originally built as an open car by Mahoney Bros. in 1887. Rebuilt and renumbered from No. 543 to No. 504 in 1915 by the United Railroads. Built by the Carter Bros. of Newark, California during 1893-1894 for the Market Street Railway's Sacramento-Clay cable car line. The United Railroads transferred it to the Powell Street cable car lines in 1907, after the Earthquake and Fire of 1906. Until 1973, numbered as No. 505. Extensive rebuilding, by Muni's Elkton shops 1956, using original roof and seats. Built by the Carter Bros. of Newark, California during 1893-1894 for the Market Street Railway's Sacramento-Clay cable car line. The United Railroads transferred it to the Powell Street cable car lines in 1907, after the Earthquake and Fire of 1906. Until 1973, numbered as No. 507. Extensive rebuilding, by Muni's Elkton shops 1957. First test car on the then new Powell-Hyde cable car line, March 1957. Built by the Carter Bros. of Newark, California during 1893-1894 for the Market Street RailwayÁs Sacramento-Clay cable car line. The United Railroads transferred it to the Powell Street cable car lines in 1907, after the Earthquake and Fire of 1906. Until 1973, numbered as No. 508. Extensive rebuilding, by Muni's Elkton shops 1958. Built in 1997 by the Muni, new No. 9 entered revenue service April 24, 2000 painted in a green and white paint scheme similar to the colors of former cable car operator the Market Street Railway (1921-1944). First No. 9 removed from service in 1995. Built by the Carter Bros. of Newark, California during 1893-1894 for the Market Street Railway's Sacramento-Clay cable car line. The United Railroads transferred it to the Powell Street cable car lines in 1907, after the Earthquake and Fire of 1906. Until 1973, numbered as No. 510. Extensive rebuilding, by Muni's Elkton shops 1960. Built by the Carter Bros. of Newark, California during 1893-1894 for the Market Street Railway's Sacramento-Clay cable car line. The United Railroads transferred it to the Powell Street cable car lines in 1907, after the Earthquake and Fire of 1906. Until 1973, numbered as No. 503. Extensive rebuilding, by Muni 1977. First car rebuilt at MuniÁs new Woods Carpentry Shop. Built by the Carter Bros. of Newark, California during 1893-1894 for the Market Street Railway's Sacramento-Clay cable car line. The United Railroads transferred it to the Powell Street cable car lines in 1907, after the Earthquake and Fire of 1906. Until 1973, numbered as No. 512. Extensive rebuilding, by Muni's Elkton shops 1959. No. 12 was exhibited in Japan in 1987. Built new by Muni in its cable car building shops. The car body at the Muni's Woods Division carpentry shop and at Pier 80 for the running gear. In service on Sept 19, 1991. Did not resume regular service until cars Nos. 13, 21, and 49 were dedicated on Dec. 5, 1992, and therefore classified as a "1992" car. No. 13 is painted in a green with red-trim paint scheme similar to the colors of the United Railroads, a former operator of the Powell Street cable cars. The first No. 13 (Until 1973, numbered as No. 513) was built by Carter Bros., and was extensively rebuilt in by Muni's Elkton Shops 1958, using the original roof and seats. The first No. 13 was scrapped in 1988. Built at Muni's Elkton shops. In service late January 1964. Until 1973, numbered as second No. 514. The first No. 514 was built by Mahoney Bros. in 1887. It was renumbered from No. 528 to No. 514 by the Market Street Railway on Dec. 13, 1929. First No. 514 was scrapped in Oct. 1963. Built by the Carter Bros. of Newark, California during 1893-1894 for the Market Street Railway's Sacramento-Clay cable car line. The United Railroads transferred it to the Powell Street cable car lines in 1907, after the Earthquake and Fire of 1906. Until 1973, numbered as No. 515. Extensive rebuilding, by Muni's Elkton shops 1954. Built almost entirely new by Muni in its cable car building shops. The car body at the Muni's Woods Division carpentry shop and at Pier 80 for the running gear. Only part of the roof retained from the original car first No. 16, (until 1973, numbered as No. 516), built by Carter Bros. 1893-1894. The new car was dedicated on April 10, 1990. It is painted in the blue and yellow colors that Muni used from 1939 to 1947. Built by the Mahoney Bros., San Francisco, in 1887 for the Ferries & Cliff House Railway (Powell Street Railway). The Mahoney Bros. subcontracted with Burnham-Standeford in Oakland, California, to build its cars. Assigned to the Sacramento-Clay cable car line before the Earthquake and Fire of 1906, the United Railroads transferred it back to the Powell Street cable car lines in 1907. Until 1973, numbered as No. 517. The Market Street Railway in 1929 renumbered it from No. 532 to No. 517. Extensive rebuilding, by Muni's Elkton shops 1956. Built almost entirely new, except for some spare parts, in 1961, at Muni's Elkton Shops. In service on July 4, 1962. Until 1973, numbered as second No. 518. First No. 518 built by the Carter Bros. of Newark, California during 1893-1894 for the Market Street Railway's Sacramento-Clay cable car line. The United Railroads transferred it to the Powell Street cable car lines in 1907, after the Earthquake and Fire of 1906. Parts of first No. 518 used by Muni to build second No. 506, in 1965. (second No. 19) Built almost entirely new by Muni, except for some metal work. It was dedicated on October 7, 1986. The car body at the Muni's Woods Division carpentry shop and at Pier 80 for the running gear. The first No. 19 was originally No. 519, a Carter Bros. car, had been rebuilt by Muni and renumbered to No. 500 in 1968. Renumbered to No. 19 in 1973, it was scrapped in 1986 after being judged to be in too poor a condition to be rehabilitated. Built by the Carter Bros. of Newark, California during 1893-1894 for the Market Street Railway's Sacramento-Clay cable car line. The United Railroads transferred it to the Powell Street cable car lines in 1907, after the Earthquake and Fire of 1906. Extensive rebuilding, by Muni in 1968 using original roof and seats. Until 1973, numbered as No. 520. Ridden by Humphrey Bogart in the 1947 movie Dark Passage. (second No. 21) Built almost entirely new by Muni in its cable car building shops. The car body at the Muni's Woods Division carpentry shop and at Pier 80 for the running gear. Dedicated on Dec. 5, 1992. The first No. 21 was built by Mahoney Bros. in 1887. The Mahoney Bros. subcontracted with Burnham-Standeford in Oakland, California, to build its cars. It was rebuilt in 1918 by the United Railroads, and renumbered from No. 533 to No. 521 by the Market Street Railway on Dec. 16, 1929. Until 1973, numbered as No. 521. The first No. 21 was judged to be in too poor a condition to be rehabilitated in the 1982-84 rehabilitation program, and was scrapped in 1987. Built by the Mahoney Bros., San Francisco, in 1887 for the Ferries & Cliff House Railway (Powell Street Railway). The Mahoney Bros. subcontracted with Burnham-Standeford in Oakland, California, to build its cars. Assigned to the Sacramento-Clay cable car line before the Earthquake and Fire of 1906, the United Railroads transferred it back to the Powell Street cable car lines in 1907. Until 1973, numbered as No. 522. Extensive rebuilding, by Muni's Elkton shops, 1956. Built by the Ferries & Cliff House Railway (Powell Street Railway) in 1888-90 at the Washington-Mason barn. Assigned to the Sacramento-Clay cable car line before the Earthquake and Fire of 1906, the United Railroads transferred it to the Powell Street cable car lines in 1907. Extensive rebuilding, by Muni at the Elkton shops in 1970,using the original roof. Until 1973, numbered as No. 523. Built by the Mahoney Bros., San Francisco, in 1887 for the Ferries & Cliff House Railway (Powell Street Railway). The Mahoney Bros. subcontracted with Burnham-Standeford in Oakland, California, to build its cars. Assigned to the Sacramento-Clay cable car line before the Earthquake and Fire of 1906, the United Railroads transferred it back to the Powell Street cable car lines in 1907. Renumbered from original No. 534 to No. 524 by the Market Street Railway on December 16, 1929. Under sponsorship of the Western Pacific Railroad, No. 524 was operated at the Chicago Railroad Fair 1949. On September 2, 1956, car No. 524 made the last trip on the Washington-Jackson line. Extensive rebuilding by Muni, 1958. Built by the Ferries & Cliff House Railway (Powell Street Railway) in 1888-90 at the Washington-Mason barn. Assigned to the Sacramento-Clay cable car line before the Earthquake and Fire of 1906, the United Railroads transferred it to the Powell Street cable car lines in 1907. Extensive rebuilding, by Muni at the Elkton shops in 1976. Until 1973, numbered as No. 525. Built by the Ferries & Cliff House Railway (Powell Street Railway) in 1888-90 at the Washington-Mason barn. Assigned to the Sacramento-Clay cable car line before the Earthquake and Fire of 1906, the United Railroads transferred it to the Powell Street cable car lines in 1907. Extensive rebuilding, by Muni at the Elkton shops in 1973-75. Until 1973, numbered as No. 526. Built by the Mahoney Bros., San Francisco, in 1887 for the Ferries & Cliff House Railway (Powell Street Railway). The Mahoney Bros. subcontracted with Burnham-Standeford in Oakland, California, to build its cars. Assigned to the Sacramento-Clay cable car line before the Earthquake and Fire of 1906, the United Railroads transferred it back to the Powell Street cable car lines in 1907. Extensive rebuilding, by Muni at the Elkton shops in 1958. Until 1973, numbered as No. 527. Built by the Mahoney Bros., San Francisco, in 1887 for the Ferries & Cliff House Railway (Powell Street Railway). The Mahoney Bros. subcontracted with Burnham-Standeford in Oakland, California, to build its cars. Assigned to the Sacramento-Clay cable car line before the Earthquake and Fire of 1906, the United Railroads transferred it back to the Powell Street cable car lines in 1907. Originally built as open car No. 544. Rebuilt and renumbered to No. 501 by the United Railroads, December 13, 1912. Extensive rebuilding, by Muni at the Elkton shops in 1951. Renumbered 1973, as No. 28.